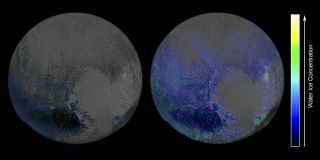 These maps of water ice on Pluto's surface were created using data captured by NASA's New Horizons spacecraft during its flyby of the dwarf planet on July 14, 2015. The map at left is an early effort; the one at right used modeling techniques to achieve greater sensitivity. The new map is more sensitive than an earlier version also produced using flyby observations, and thus shows more water ice — the dwarf planet's bedrock material — cropping up across Pluto's surface than had been seen previously, NASA officials said. "But despite its much greater sensitivity, the map still shows little or no water ice in the informally named places called Sputnik Planum (the left or western region of Pluto’s 'heart') and Lowell Regio (far north on the encounter hemisphere)," NASA officials wrote in a statement Thursday (Jan. 28). "This indicates that at least in these regions, Pluto's icy bedrock is well hidden beneath a thick blanket of other ices such as methane, nitrogen and carbon monoxide."